I'm psyched to be starting off 2019 with new projects, like John Wubbenhorst's Facing East with Tom Canning and Steve Zerlin; and Jason Everett's Deep Energy Orchestra with Trey Gunn, Fareed Haque, Radhika Iyer Phil Hirschi, Rachel Nesvig, Aleida Gehrels and Chaz Hastings! 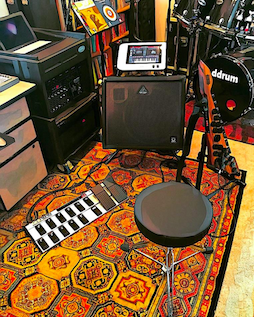 Playing with these great musicians requires not only lots of shedding, but also updating my live Zendrum set-up with some new gear. Gone are the days when I needed a rack full of gear, like an Alesis D4, Alesis DM Pro, Akai S2000 Sampler, and effects like Yamaha Rev 100 or Alesis MIDIverb, and a Mackie line mixer. The modules soon gave way to laptops, stocked with VSTs, and the gear has gotten smaller, like the new Zendrum Stompblock. The iPad Pro has supplanted my MacBook Pro and MacBook Air, and the new keyboard amps that come with built in EQ and effects have all but replaced all those heavy, powered speakers and rack mounted mixers. The newest addition to my set-ups are MIDI foot controllers and loop stations. I'll take a closer look at the loop stations in my next blog, specifically the Boss RC-300. For now, I'll examine the Behringer FCB1010 MIDI Foot Controller. I'd already been using Behringer gear; Mixers, etc. When I switched to the iPad, I used the Behringer iStudio iS202 interface. 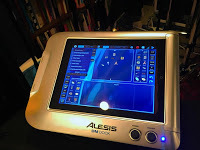 That worked great, but it was older and doesn't work with newer, lightning connector iPads, so I had to switch to the Alesis DM Dock which comes with adapters for both. The iPads were loaded with percussionist extraordinaire Pete Lockett's fabulous "DrumJam" app, hands down the best percussive app I've ever used. With my MacBooks, I used BFD2 with the Billy Cobham/Ken Scott samples. I loved them a lot, and gladly installed them in the Zendrum Stompblock, and later when I was pleasantly surprised to get SampleTank for iPad, also with Cobham/Scott samples. FYI: They only work on newer iPads. DM Dock to the rescue again! In the old days, I used a MOTU Firewire MIDI interface, with an expression pedal to control the volume via MIDI, so I was familiar with MIDI Control Change messages (CC #7 for volume). After a bunch of research I settled on the Behringer FCB1010. After struggling to figure out how to get it to work, (a major complaint of reviewers), I turned to YouTube and happily found a ton of tutorials that solved my problems. I connected it to the DM Dock and voila, MIDI volume control was enabled! To my surprise the Up/Down pedals allowed me to scroll through all of the kits and drums in the DrumJam app. 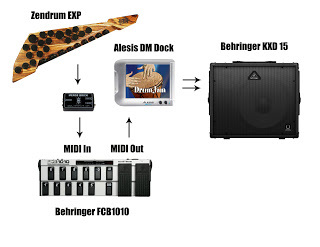 I immediately connected my Alesis DM10 modules and it also enabled me to change kits with the touch of my toes! 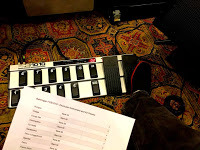 As a stand alone MIDI foot controller, the FCB1010 works great for me, however guitarists, bassists and others may have an entirely different view; Changing patches and effects may be a real challenge, and many folks I know have given up on it, cursing it's complicated hierarchy. Figuring this stuff out isn't very intuitive, but if you can get a grip on that, you may be able to unlock its potential. As an electronic percussionist, it's great to be able to go from a drum kit, to a kanjira, or a marimba with a tap of my toes. But this percussionist doesn't live by kits alone. I use a ton of samples and loops in more than a few groups. I used able to to that with an Akai sampler, and later with a sample filled laptop and an Audio/MIDI USB interface. That however, was challenging with just the iPad. The answer apparently lies in the brave new world of the MIDI loop stations by Roland/Boss, and Digitech. I'll share my discoveries in my next blog.